The calendar for all EBED Club Director Training courses may be found here - CLUB DIRECTOR COURSE CALENDAR. Clubs and counties may also be arranging their own training sessions. For information on this please consult with your local club or contact Richard at EBED. We run these courses at clubs all over the country. Please email Richard at EBED if your club would be interested in hosting a course. All courses are open to members of affiliated and non-affiliated clubs. Participants do not need to be members of the English Bridge Union. 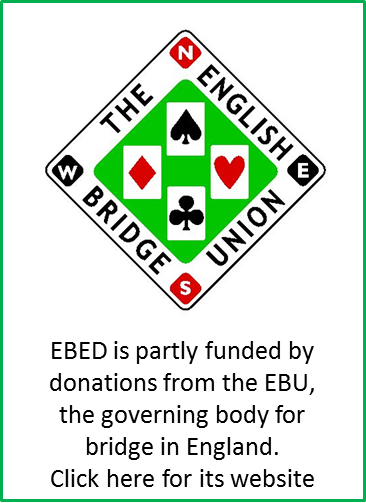 All training in EBED courses is provided by experienced tutors with first hand experience of running major national events on behalf of the English Bridge Union. Much of the course material involves practical simulations of situations at the table - and therefore additional trainers are provided for larger class sizes. To book a place on one of these courses, please log onto My EBU and select the Book Courses option from the Utilities tab or contact Richard Banbury on 01296 317218. Payment is required at the time of booking. EBED Club Director training is a 4 day programme consisting of a 1 day session called "How to run a club duplicate"; and a 3 day Club Director course, focused on the Laws and giving rulings at the table. The 1 day session is not a prerequisite for attending the club director course - but it would be normal to do so unless the individual already has some experience of running a club session. Each day of the course has standardised content - so participants can choose whichever venue is most suitable for each day. "How to Run a Club Duplicate"
This course is an introduction and ice breaker for those who might still be thinking whether becoming a director at their local club is something suitable for them. The course introduces delegates to the skills which a good director will need and the organisational aspects of running a club session - eg movements, scoring, technology, etc. The course would also be suitable for individuals who just wish to help out at their clubs as scorers or "session managers". The session can be run as a stand alone event or in advance of the main 3 day training course. This course focuses on both "Book" and "Judgement" rulings which have to be given by a director at the typical club level. You will receive a booking confirmation/invoice by email at the time of booking - and then a further email with detailed information on the course and pre-course materials approximately ten days before the course is due to take place. We also arrange half-/one-day Refresher Courses suitable for those who have already attended the Club TD course above, but perhaps have taken a break from regular directing or want to refresh their knowledge and build their confidence when dealing with more difficult situations at the table. It is anticipated that such courses will be tailored in response to information from the hosting club and the participants - i.e. they may be focused on a revision of book rulings, or explore judgment rulings in more detail. Question and Answer sessions are often extended to cover a wide range of issues. Sessions can also be arranged to provide training for the use of EBUScore and on the choice of movements. These sessions may be arranged for individual clubs, or for a wider public. Please email EBED for more information. For more experienced directors, with ambitions to progress to a county or national level, advanced training is provided in the form of a 'refresher day' held at the EBU Headquarters in Aylesbury, in May each year. Material from previous County courses is used to give delegates a flavour of harder book and judgement rulings. It will also cover use of the EBU’s White Book (the essential guide for tournament organisers). Full details of the course are here. Download a test paper consisting of 40 situations to consider: book rulings, judgement rulings and, in some cases, good old-fashioned common-sense. Some are quite intricate and others straightforward, but hopefully they will all make you think. This course is designed for Club TDs who need more experience of rulings and is ideal preparation for the County Director’s Course held annually in September. Full details of the course are here. You can study or download useful flow charts on the most commonly infringed laws here.